Angela Doll Carlson (don’t you just love her name?) and I have never met in person, but I feel like we know each other. We met on Facebook. And we’ve both contributed essays to the Saint Katherine Review. And we’re both converts to Orthodox Christianity. But our stories are completely different. Well, not completely, since Angela and her husband were part of a religious “start up” group which bore some similarities to the early years of the Evangelical Orthodox Church, which my husband and I were part of. But Angela grew up Catholic, so there’s that. And while I’ve written a memoir about my experience of becoming Orthodox, I decided not to publish it. 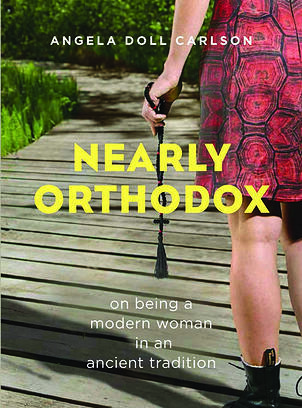 Angel’s memoir, Nearly Orthodox: On Being a Modern Woman in an Ancient Tradition, was recently published by Ancient Faith Press, and it’s terrific. Wait… don’t stop reading if you think this is only a book for Orthodox Christians. Or Christians in general. It’s so much more than that. It’s a book, as the Orthodox poet and theologian Scott Cairns says, that might “comfort, serve and assist other pilgrims along the way.” Yes, it’s about Angela’s spiritual pilgrimage and it’s filled with candid looks into a pilgrim’s honest grappling with issues many of us face, but few of us talk (or write) about. Beth had tried homeschooling…. Her artist-mom temperament made her a natural life teacher…. It sounded good on paper, this pairing of freedom and bonding and making the world a vast learning environment…. When Beth told me about the new plan to send Grace to school… the first thing she said was that Grace needed structure. They both needed it…. Because it allowed them both to be wild in their art lives. One reason I started writing (painting) icons is also one of the reasons I quit—because writing icons requires lots of structure. There are many rules and even Church canons governing the process, and at first I found comfort in those rules. But eventually I realized that I was hiding within the liturgical art form when everything in my being was crying out to be “wild in my art life.” Iconography isn’t for everyone. Neither is Orthodoxy. My chrismation didn’t fix me, because I will always be in need of healing from the bleeding wounds I brought into the faith with me the day I was welcomed. I am always going to be healing, always practicing the faith, just nearly Orthodox—almost there, within reach, welcome at the feast, given food for the journey—because the road is long and winding, and it was never about the destination. It was always about the road. In my own personal experience I have to say that it IS about the destination for me. If it was only about the road, I might not have made it. The road was (and often still is) too difficult. Too full of dangerous curves and unsafe passages. Sometimes I don’t feel that the destination (the Orthodox Church) was worth the journey, which damaged my soul as much or more than my years leading up to that journey. But I can still appreciate Angela’s story. And it’s so well written that it should be read and enjoyed for its own sake. She figured out a way to be “wild in her art” and to produce a memoir that is truly a work of art.